You can also read my Round-the-World blog. If you want to hear me perform between now and March, you’re going to have to buy a plane ticket! The European leg of the Here And There tour starts now. I guess you could call this the “There” portion. 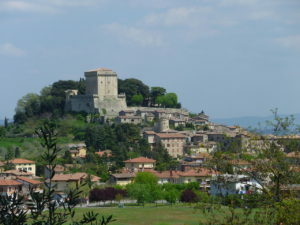 So far, I will be performing in London, Rome, and Sarteano, Tuscany. 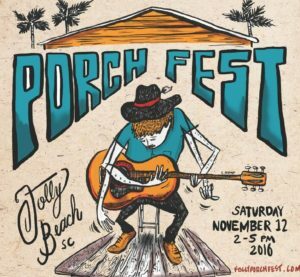 I am proud to announce that Folly Beach Porch Fest, the music festival I brought to town, is entering its third year and looking better than ever! The idea behind Porch Fest started in Ithaca New York and has spread throughout the country and the world. Local musicians perform on your neighbors’ porches and yards on Folly Beach. It’s a free, family friendly event. This year’s festival takes place Saturday, Nov. 12, from 2-5 p.m.
More information is available from Charleston City Paper. Folly Beach, SC: Local musician Eddy Boston is celebrating the release of his debut album Here And There at well-loved local bar Chico Feo on Thursday, September 15, at 7 p.m.
Eddy Boston has channeled two decades of songwriting and performing into his debut studio album, Here And There. With a talented cast of local musicians, his thoughtfully written songs come to life on this polished effort. Recorded and mixed by Eric Rickert at James Island’s own Ocean Industries, the album channels the lyrical emphasis of artists like Paul Simon and Jim Croce, but with a catchy modern sound. Song styles range from the Buddy Holly inspired Just One More, to the reggae-tinged Fix It, through the toe-tapping bluegrass number Lovely Soul. Well-known local singer Miranda Jordan (of the band Headrush) lends her vocals to the sweetly upbeat Yes I See, while Boston strips it down to voice and fingerpicked guitar in This Is My Life, a bittersweet ode to reinvention that is still more sweet than bitter. Eddy Boston arrived on Folly Beach in September 2010. “I came for a month, but fell in love with the place and decided to stay. It’s fitting that the album release party is on my six year ‘Folly-versary,'” said Boston, a native of Massachusetts whose off-stage last name is Sullivan. “I’ve had second thoughts about the stage name before, but people seem to remember it, and there’s already a famous Ed Sullivan,” he said. His unique brand of acoustic originals and popular covers has already attracted a following around Charleston. The Release Party will feature live performances by Eddy Boston and others, giveaways, and the usual Folly fun time.